How far away a chicken coop must be located from a residence depends on factors such as available space, personal preferences and local laws. While many communities don’t address chicken housing, those that do have widely varying requirements. Typically such laws will specify that chickens must be housed some distance from residences, as few as 10 feet or as many as 150 feet. Requirements also vary depending on whether the home in question is that of the chickens' owner or of a neighbor. The main concerns about chicken coops are odor, noise and flies. Chicken feces and spilled food may have an odor that could bother humans living too close to them. Dirty litter on the floor or yard of the chicken coop also attracts flies that may carry bacteria or other organisms from the feces into nearby houses, potentially causing health concerns for the residents. Locating the chicken coop away from the house minimizes these impacts. The further the chickens are from houses the less likely it is that they will cause sanitation or other issues for the people living there. Prevent problems when locating a chicken coop by checking local regulations before getting started. Measure setback distances carefully to avoid possible legal difficulties or complaints from neighbors. 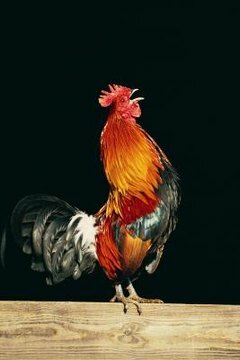 Many areas don’t allow roosters no matter how far the coop is from human residences, making noise much less of an issue. Never overcrowd your chickens, since this can result in health problems for your flock. Keep coops clean and use fresh, dry litter at least once a week to reduce or eliminate odor and flies.